Keyboards that use mechanical switches are some of the best keyboards you can buy today — especially for gaming applications. They’re meant to last for decades; however, they won’t be able to offer the best performance without the regular maintenance and cleaning. With time, mechanical keyboards will catch grime and dust. 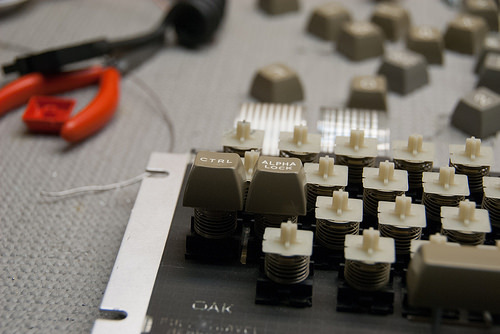 If not regularly cleaned, the dirt and grime will cause failure in the keyboard’s switches. As such, cleaning is an important part of mechanical keyboard maintenance. 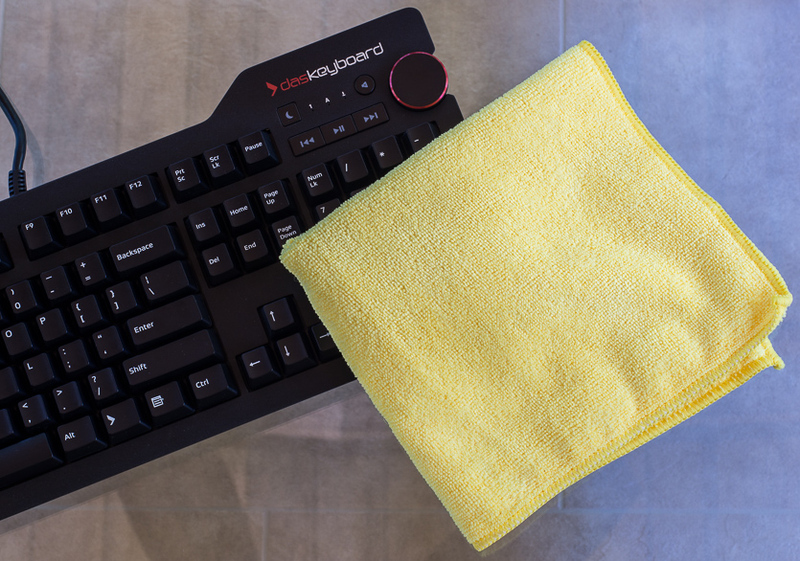 Cleaning the surface of a mechanical keyboard is easy. It should be done after every few days to get rid of dust and dirt that may have collected on the surface. Likewise, if you happen to spill liquid on your keyboard accidentally, it is advisable to clean it right away for damage control. Disconnect the keyboard from the computer to prevent it from short-circuiting. Next, use a paper towel, disposable cleaning wipes, or a bath towel to soak up the spilled liquid. 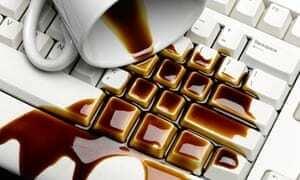 Press the sheet gently against the keyboard to absorb the spilled liquid. Then, having soaked up all the spilled liquid, you need to allow the keyboard to air dry. In this regard, allow the keyboard 2 to 3 days to fully air dry before trying out anything else on it. This is just regular cleaning of the keyboard to remove dirt from its surface. As mentioned earlier, it should be carried out every few days. Use a damp wipe or a paper towel to wipe down the surface of the console. While doing this, be sure to clean off any sticky patches on the surface of the keyboard. Wiping off the dirt on the surface of a keyboard will prevent it from getting down to the key switches and cause more problems. Additionally, you can apply Jelly compound on the surface of your keyboard. 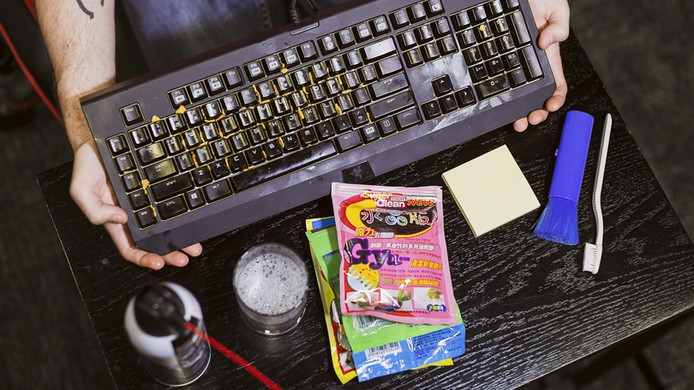 This compound has been proven to be highly effective at cleaning keyboards because it can conform to the console’s spaces and will attract all the dirt and debris stuck its tight spaces. For a thorough cleaning, you can remove the keycaps as well. After that, you may dab this sticky substance on the switches, too. However, even with regular cleaning, bits of dirt will still manage to penetrate the console’s inside. If left unattended, they may cause the mechanical key switches to fail with time. Thus, it is advisable that you clean the inside of the keyboard every once in a while. For that, you need to take the keyboard apart. You should pull them out one after another. Consider using a keycap puller. However, when using a keycap puller, you are supposed to push each of the keycaps downwards before pulling them. It is advisable to keep the keys sorted as you pull them out to make it easier for you to reapply the keycaps afterwards. Then, having removed the keycaps, proceed to washing them using gentle dish soap water. Warm water gives better results. Now, on cleaning your mechanical keyboard’s sticky keys, use a paper towel. Once they are clean, lay the keycaps out to dry out. Leave them for a day or two before you reattach them to the keyboard. 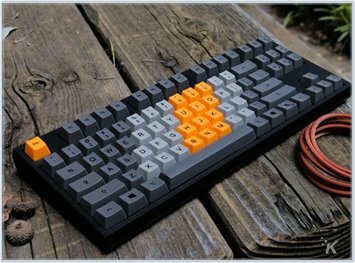 Take the keyboard outside with the keycaps removed and turn it upside down to dump all debris and dirt inside. While doing this, you need to be very careful not to dump any of the internal components of the keyboard. As such, you should just shake it gently. 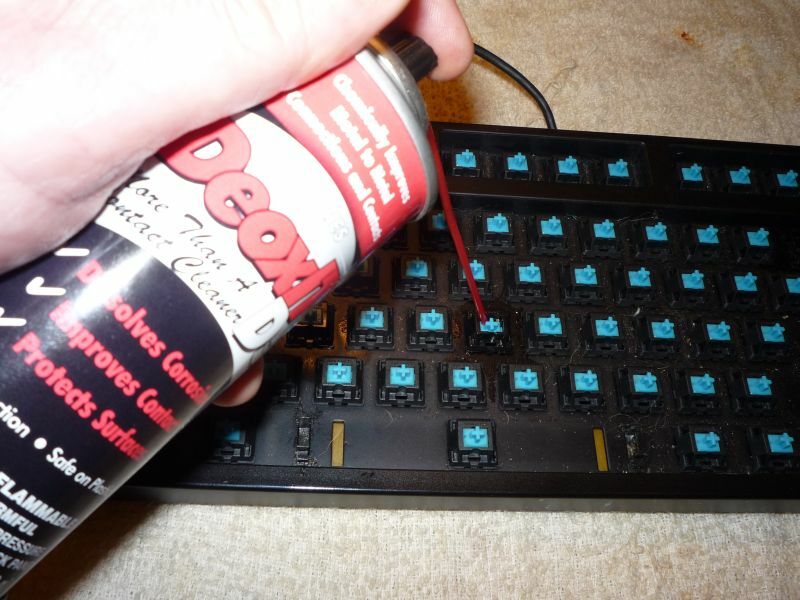 You should then spray compressed canned air into the keyboard while still holding it upside down. This will help remove even more dirt and grime from the inside of the keyboard. Dampen the pipe cleaner using rubbing alcohol. Run the damp pipe cleaner gently along the spaces of the dismantled keyboard. At this point, you should avoid using too much alcohol to prevent the liquid from dripping onto the inner components of the keyboard. Allow the rubbing alcohol to dry out completely before reassembling to prevent the keyboard from short-circuiting. You have now cleaned the keycaps and the inner parts of your keyboard and allowed them enough time to dry out. It is now time to reassemble the components. In this regard, you are supposed to snap each of the keycaps back to its initial position on the console. Though necessary, dismantling your mechanical keyboard to clean the inside is a bit risky. Hence, while at it, you need to be very careful not to damage the console. Other than that, the above-discussed steps will help you clean the inside and outside of your mechanical keyboard on your own.